Green Cities Fund, Inc. was established in 2005 as a California public benefit corporation, and is tax exempt under Section 501(c)(3) of the Internal Revenue Code. Its founders have been involved in public service work for many years, starting in the 1950’s with Canada’s “Frontier College”, the predecessor of the Peace Corps, where college students spent their summers working on railway gangs and in mining camps teaching the workers at night, and handling a myriad of problems that develop in these tough and remote environments. Frontier College led to teaching in Ghana, West Africa and the establishment of the Yale Men Abroad Program, with the help of Chaplain William Sloane Coffin, where Yale students and graduates served overseas in “Third World” countries. This led to assisting with the establishment of the Peace Corps, and the training and placement of the first group of Peace Corps Volunteers, in Ghana, West Africa. During the Vietnam War, in 1966, the founders established, in Vietnam, the Center for Plastic and Reconstructive Surgery to treat children injured in the war. Led by world-renowned surgeon, Dr. Arthur Barsky, who had been Chief Surgeon of the Hiroshima Maidens Project, the Center treated thousands of war victims, including a little girl, Phan Thi Kim Phuc, whose photograph fleeing terror-stricken with her brother down a road after being burned by napalm shocked the conscience of the world. With funding from Japan and Australia, the Center continues today. As the American War in Vietnam ended, the founders assisted UNICEF expand its programs throughout Indochina, and when thousands of Vietnamese children were rushed to the United States in the U.S. Government sponsored “Orphan Airlift” (PDF), they intervened in an attempt to return the many children who were not orphans to their families. The story of one such child was told in Gail Dolgin’s documentary “Daughter from Danang“, which received the grand prize at the Sundance Film Festival, and was an Oscar nominee. In 2015, on the 40th anniversary of the Orphan Airlift (video), the founders participated in an exhibition and ongoing discussion of international adoption at The Presidio, in San Francisco, where the Orphan Airlift children arrived and it was discovered that many were not orphans. They have also participated in the production of films on Vietnam, Cuba and South America by Oscar winning documentary filmmaker Pierre Dominique Gaisseau, Sarah Harbin (“Sonata for Left Hand“), NBC (“Sins of the Fathers” about American fathered children in Vietnam); the Canadian Broadcasting Corporation, Al Jazeera and Britain’s Channel 4. In recent years they have served on the board of Global Exchange, a San Francisco human rights organization; provided free legal assistance to scores of U.S. citizens fined for exercising their Constitutional right to travel to Cuba as well as assisting “Send A Piana to Havana” donate pianos to Cuban schools and churches. In cooperation with Alice Waters, Chez Panisse chefs, and Cuba’s leading environmental organization, the Antonio Nunez Jimenez Foundation, Green Cities is sponsoring the “Planting Seeds” project in Cuba to work toward local, organic food sustainability, and a healthier diet for all Cubans, and is also the sponsor of EcoCuba environmental projects. They have also joined with University of California at Berkeley researchers in a project to restore Cuba’s longest river, the Cauto, which runs through Berkeley, California’s “Sister City”, Palma Soriano. A short film on Palma and the project can be viewed here . Working with Cuban economists, Green Cities Fund has also sponsored a number of international conferences discussing changes to Cuba’s economic system. In 2007 they secured the nomination of Cuban Medical Workers, who have contributed so much to the quality of health care in Third World Countries, for the Nobel Peace Prize. Through Green Cities Fund efforts the nomination was made by Dr. Paul Farmer of Harvard and founder of Partners-in-Health, and California’s progressive congresswoman, Barbara Lee. They have continued their work in Vietnam by assisting the work of Atlantic Philanthropies, the Vietnam Green Building Council and Chi-Em, a microfinance organization serving ethnic minority villages established by the founders’ daughter, Nathalie Miller, in the remote mountains surrounding historic Dien Bien Phu, where the French were defeated by the Vietnamese in 1954. Another daughter, Gabby, has supported, Nha San, a cutting edge independent artists’ collective in Hanoi for years and other social and political art projects around the world, including Oakland, California’s pop-up “Museum of Capitalism“, which presented multiple artists’ perspectives on Capitalist ideology. They are also supporting research in Vietnam and NASA scientist Jonathan Trent’s “OMEGA Project” to produce sea-grown algae as a source for biofuel, a better alternative than harvesting land crops for biofuel, which causes food prices to increase, pitting the food needs of the poorest against the economic power of rich fuel consuming nations. This project has recently included enthusiastic participation by North Korea’s leading algae and climate change specialists. In 2002, they assisted in the establishment of Parwaz, the first Afghan-run microfinance institution and in 2009 they embarked on an effort to save Prey Lang – “Our Forest”, the largest remaining lowland semi-dry evergreen forest in Southeast Asia and home of the Kuy ethnic minority. A trailer from a documentary on Prey Lang can be seen here. Green Cities Fund founders are also active in Haiti, where they have traveled extensively, and where they assist FONDAM, a foundation established by the Monnin Family, founders of Galerie Monnin and who have been involved in Haiti’s cultural life since 1947. Recently the organization has established an assistance program for the Karenni ethnic minority in Oakland, California, where they have been resettled as political refugees from Burma, after having fought the oppressive regime there for generations. Donations to Green Cities Fund are tax deductible and 100% of your donation is used for the specific project you designate. The Founders receive no compensation and pay all overhead costs. In 1967, while the war in Vietnam was raging, Tom Miller, who was practicing law in New York, read a report by MarthaGellhorn about the effects of napalm on the Vietnamese, especially children. 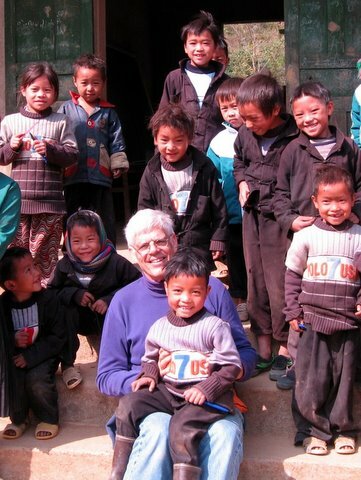 He left his New York law practice to become a founder of Children’s Medical Relief International, a nonprofit with the aim of establishing a hospital in Vietnam. By 1969, after two years of operation in temporary headquarters, Miller and physician and Abraham Lincoln Brigade veteran Arthur Barsky had overseen the construction of the Center for Plastic and Reconstructive Surgery, a modern medical facility that treated victims of bombing and napalm, as well as children born with birth defects as a result of the use of Agent Orange. It was that center that treated Kim Phuc, the girl pictured running from her burning village during the war. In 1973, Miller was working with victims in Vietnam when he met Tran Tuong Nhu. They were married that year. (And she later became press secretary to Oakland Mayor Jerry Brown.) They’re planning to travel to Vietnam next spring to mark the 50th anniversary of the center, and are raising money through Green Cities Fund (greencitiesfund.org) to buy equipment and support for what’s become a national teaching hospital. The facility recently expanded from two floors to 11, one of which will be dedicated in honor of Miller and Dr. Barsky.